Salone Satellite 2018 - the Design daily selection. Always one of my favourite destinations during Milan Design Week, Salone Satellite is one of those constants in a week of frenzied hype and expectation. 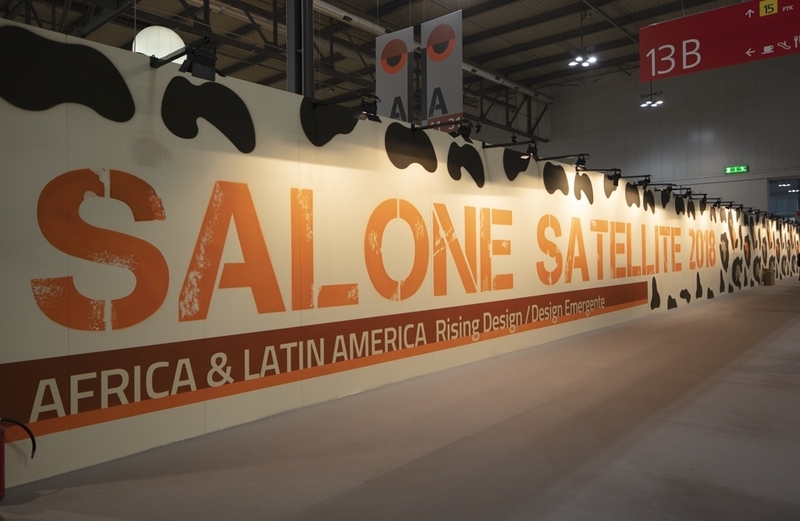 Now in its 21st year, the showcase created for fledgling studios and young designers under the age of 35, Salone Satellite has a rigorous vetting process to ensure that the quality remains high. A limitation on the number of years a designer can apply prevents the same faces from appearing more than three times. These restrictions are a good thing as the cost of showing elsewhere would otherwise convince many young designers to remain under the wing of founder Martha Griffin Wilshire for far too long! The entrance to this year's Salone Satellite within Salone del Mobile. The work of his year's crop of 650 enthusiastic designers was displayed across 2800 square metres of floor space in Pavilions 13 -15 at Salone del Mobile. The event had an extra dose of South American and African flavour as Satellite created an AFRICA & LATIN AMERICA Rising Design / Design Emergente video exhibition. The Campagna Brothers curated the Latin American section while founder of Africa Design Days, Hicham Lahlou, selected work from across Africa. The role of the video presentations was to encapsulate the meaning of coming from a particular place and how different designers expressed this in their work. In all 36 designers were selected for the exhibition. You can see a full list of the South American designers selected here. You can see the African selection here. "When we talk about design and art in general, we are not talking about a single Africa. Every part of Africa has its own raft of creative and cultural patrimonies, which converge into one single melting pot". 'Blantyre' vases from People of the Sun - a platform for connecting artisans from Malawi with international markets. "We wanted to give a small something back to everyone with the ability and sensitivity to share a design that is liquid". 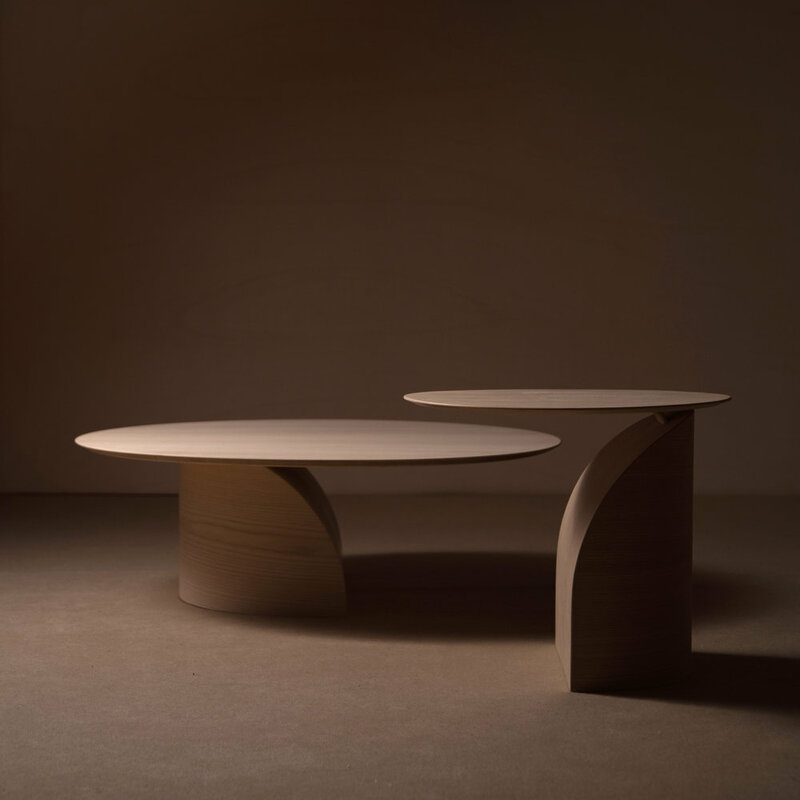 Limited edition 'Ninho' tables by Argentinian designer Cristian Mohaded. In the area beyond the Rising Design / Design Emergente exhibition spaces, a massive number of young design talents showed a small selection of their work to manufacturers, press fellow students and the general public. One such exhibitor was young Chinese designer Trianyi Shi Design who displayed her 'Inside Out' collection - a graduation project. The flexible foam seating concepts might not be everyone's cup of tea but they were they were at least visually arresting with their combinations of pastel colours and speckled conglomerated foam. Trianyi Shi Design's Inside Out furniture collection. Greek lighting designer Chris Basias returned for his second year after a knockout 2017, as did Australia's Studio Truly Truly whose 'Daze' tables from last year are now part of the Tacchini collection. Other regulars whose stands I enjoyed included German designers Anna Weber and Antje Pesel and Dutch designers Studio Thier & van Daalen (whose lights and side tables are immediately below). Studio Their & van Daalen's 'Vapour' (top) and 'Lens' lights. The combination of plain and speckled corian and the clever use of geometric shapes is at the core of Studio Thier & van Daalen's new 'Solid / Liquid' tables, seen below. The design uses off-cuts from a factory that uses a lot of solid surface acrylic form manufacturers like Hi-Macs, Corian and Betacryl with parts being fused together under heat. The result is a nonporous seamless product. 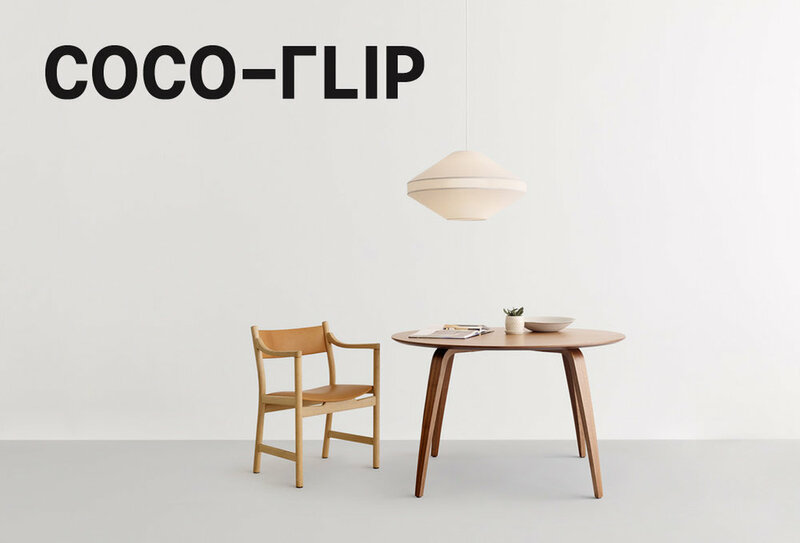 Founded by Iris van Daalen and Ruben Thier, the studio is based in Eindhoven, the Netherlands where they both graduated from Design Academy Eindhoven in 2010. 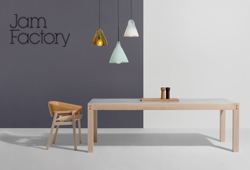 Swedish studio Stoft is three designers based in Malmo: Jenny Ekdahl, Ola Nystedt and Joel Herslow. The trio founded the studio in 2013. The word ‘Stoft’ means millions of tiny particles in Swedish. Their work is highly detailed, beautifully crafted and totally memorable. Initially drawn to the colourful and playful antics of the ‘Whittle Away’ cabinet (below) it was their ‘Shell’ lights that blew me away the most. 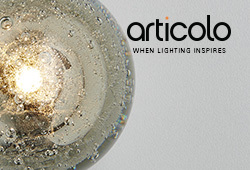 These porcelain lights have a beautiful rippled outer edge that catches the light in an amazing way. 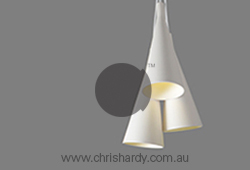 They are equally successful as either a pendant or wall light. Stoft Studio's 'Shell' pendant lights in porcelain. 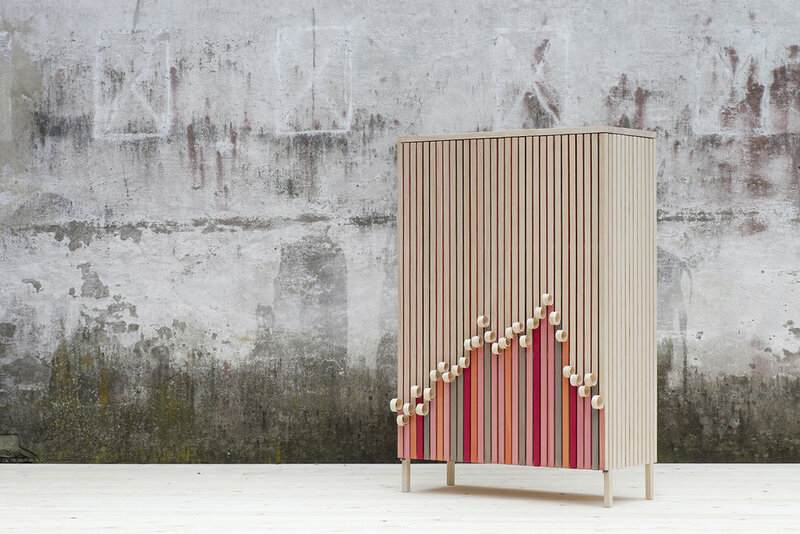 Stoft Studio's ‘Whittle Away’ cabinet is an eye-catching design with it's clever use of coiled wood veneer strips and alternating coloured battens. 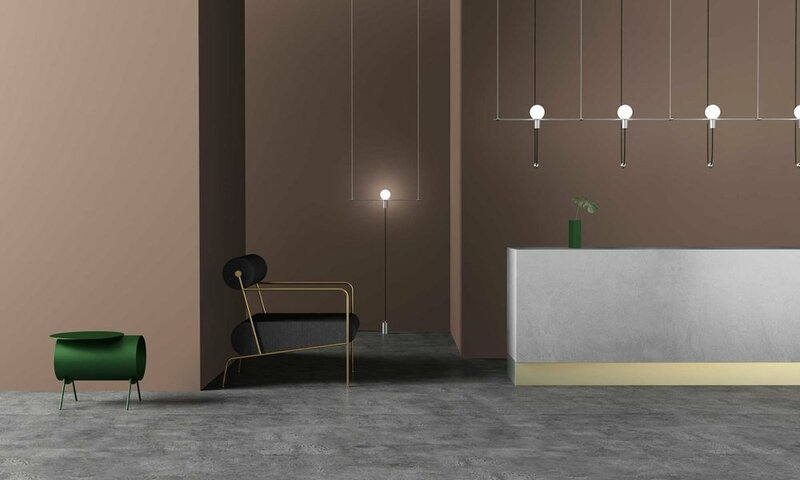 As mentioned earlier, Greek lighting designer Chris Basias returned to Satellite with several new designs pushing the combination of brass and marble into new expressive territory. The designs shown below are 'Jettus' (left) and 'Wadjet' (right). 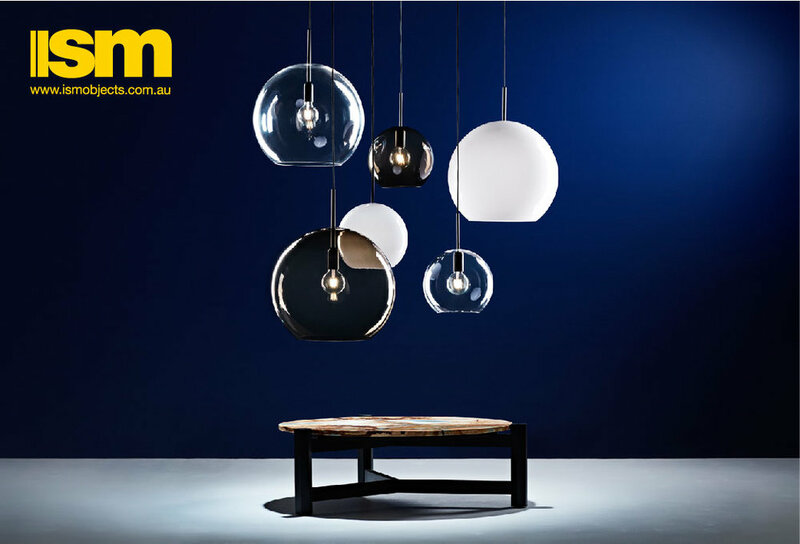 The full collection by Basias can be seen on his CT Lights website here. Anna Weber showed several new pieces along side fellow German designer Antje Pesel. Shown on the left are Weber's tables whose tinted glass tops can be flipped for different looks. The bench on the right called 'Carbon' uses the en-vogue Japanese wood preservation treatment Shou Sugi Ban (where the timber is burnt to form an outer charcoal layer) to great effect. For interior so the charred timber it doesn't rub off onto clothes and furnishings its necessary to s varnish the carbon layer. The two uprights are waxed raw steel. Having discovered Rotterdam based Australian designers Studio Truly Truly a few years ago, it has been great to watch their profile grow. Along side Joel & Kate Booy’s tremendous ‘Pitch’ lights featured in Design Daily’s last post: the Best Designs of Milan Design Week, the studio also showed new work in the form of an aluminium stacking chair called ‘Fond’. 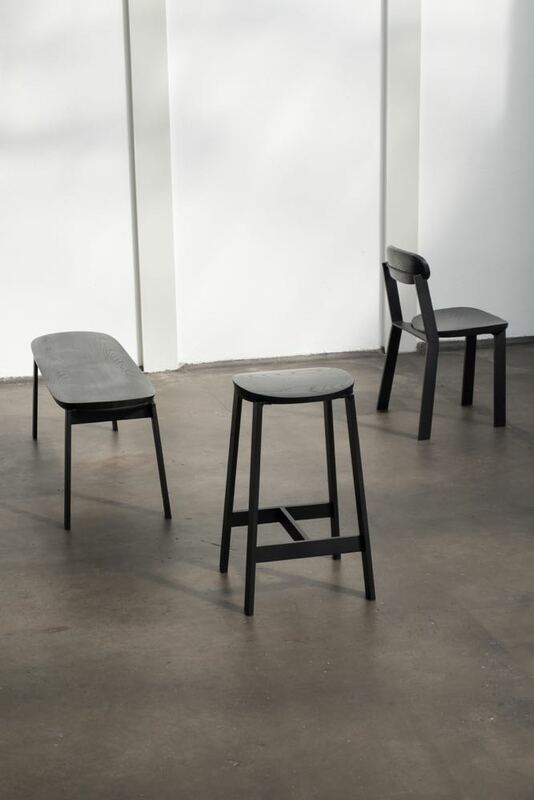 The collection consists of a chair, counter stool, low stool and Bench. Zsuzsanna Horvath is a Hungarian architect currently based in Copenhagen, Denmark. Having spent a lot of time working on laser cut items Horvath has developed an interest in finely cut paper where the tension supplied by the material left after the cutting creates amazing shapes that are prone to shimmering movement from the airflow generated by people walking past. Her stand was periodically mobbed by people during Salone del Mobile which made the designer visibly nervous as her delicate wall pieces were prodded and poked by interested onlookers. The light below is more about bouncing light off dozens of small reflectors than it is about the shape of the light itself. The creation of Japanese designer Hiroto Yoshizoe, 'Moon, sun' is based on the orbiting of planets around a sun where the light source is the sun and these small mirrors are planets. 'Moon, sun' works as a kinetic piece of art and dazzling light play. You can watch a wonderful video on it here. 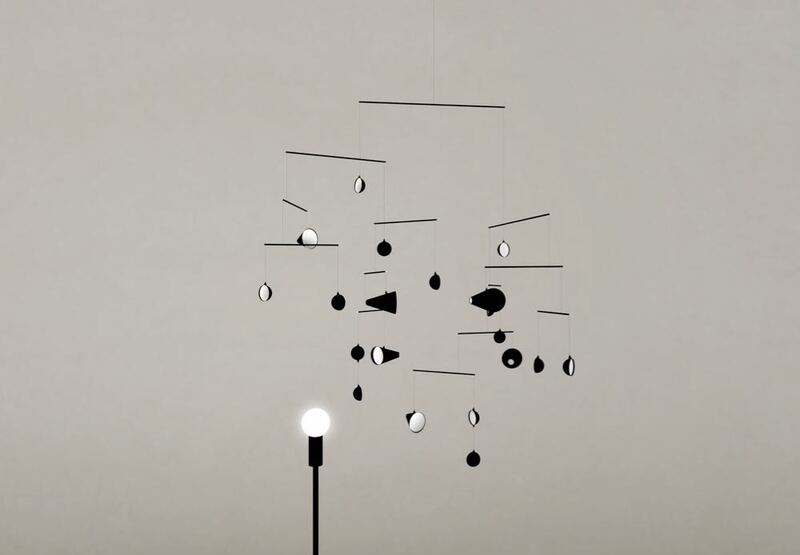 'Moon, sun' a playful interpretation of a lighting product by Japanese designer Hiroto Yoshizoe. 'Moon, sun' by Japanese designer Hiroto Yoshizoe. Below are two chairs with very different styles that caught Design daily's attention. 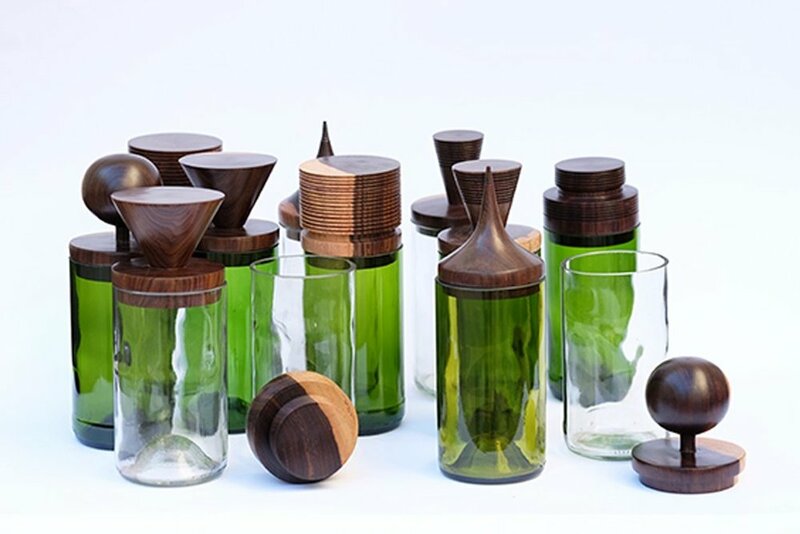 Both are by Rotterdam based designer Jonas Lutz. The one on the left is called 'Stay'. The chair swivels and has a degree of flex in the back due to play in the leather back rest. The all wood chair on the right is called 'Club' - There is no hint of movement in this little baby - just solid wood with a well positioned back and curved seat and back to create comfort. Beriana is a Berlin based studio founded by Anna Szczurek and Sophie Berianidze. The pair met while working as architects in Berlin but come from further afield - Sophie from Georgia and Anna from Poland. The 'Verdable' collection of mirrored tables is a startlingly simple concept but perfectly executed. Those without a green finger may have to resort to a dried arrangement however as there is no getting away with a sick house plant in this design. Berlin based designers Beriana showed their series of mirror topped coffee tables called 'Verdable' The tables all feature inbuilt planters bringing greenery right into the living room. Danish fashion designer architect and product designer Felicia Arvid, showed her beautifully soft designs – the ‘Addéra’ sofa (shown below) with plug in back rest and table modules along with the 'Dividéra' wall hanging /room divider. Both feature the use of wool felt. 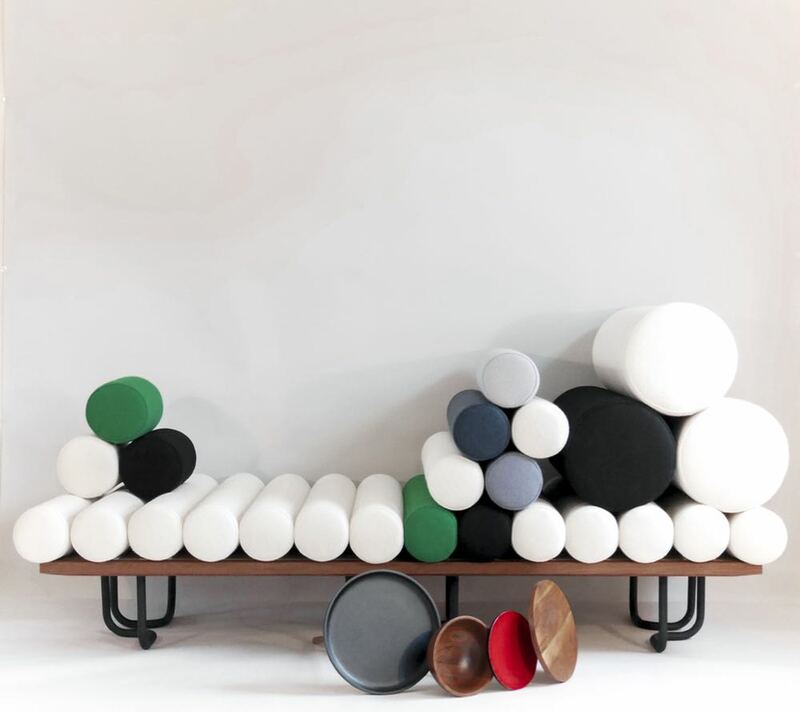 Felicia Arvid's sofa 'Addéra' shows the designers love of felted wool. The design is modular in the sense that the user can move side tables around and 'plug' them into the locations afforded by the sofa's tubular legs. Alizarina Silva is a Milan based textile designer who graduated from the Academy of Fine Arts in Milan having studied scenography. Her work on show at Salone was made of individual hand-dyed pieces of fabric stitched together in a modern form of patchwork. Unlike patchwork, her designs are conceived from scratch using water colours to design the final outcome – then she goes about making the fabrics in the colours she requires and sews them win to art pieces. You can see a great video on the process here. 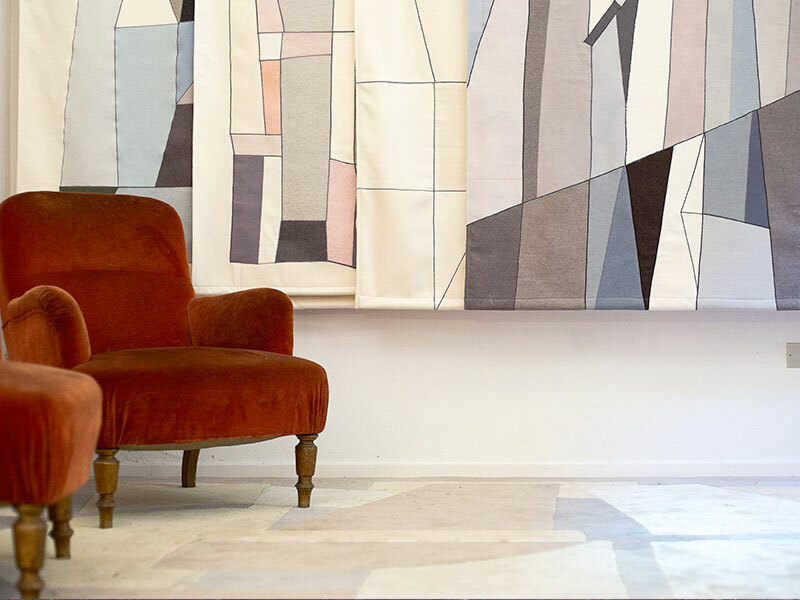 Alizarina Silva is a Milan based textile designer. Her latest work is a series of hand-dyed abstract collages. Currently completing a MA in Product Design at Oslo And Akershus University College Of Applied Science, Norwegian designer, Andrea Bue, has created a beautiful collection of pendant lights (shown below) called 'Cielo', where the user can play with the relationship between the glass (light) and the metal (dark) elements to create differing effects. Andrea Bue's 'Cielo' pendant lights. Photo by Sara Anny Hansson Kalsnes. Finnish industrial designer and exceptional maker, Sakari Hartikainen was the recipient of the European Year Of Culture 2018 award for his 'Savoa' tables in particular but also the quality and ethos of his work in general. Sakari Hartikainen's 'Savoa' side tables - a beautifully lyrical exploration of balance. ‘Focus’ is a mobile-like mirror system with multiple arms to create movement in a room along with altering the light in interesting ways. The design uses a special lens that captures the surroundings condensing them into little miniatures. Yuji Okitsu showed his acrylic snowflakes screens at Satellite in 2017 but captured the imagination of a greater number of visitors this year with the delicate movement of his new piece. 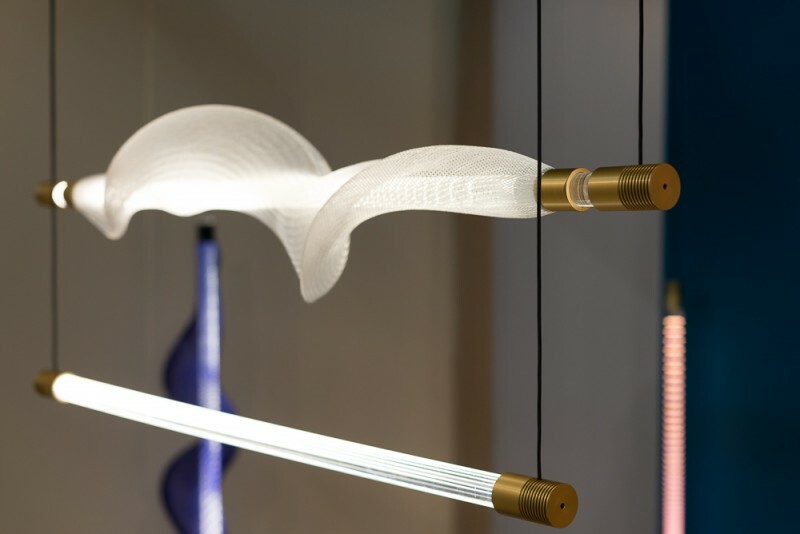 Yuji Okitsu's 'Focus' - a cross between a mobile and a light. There is no visible light source with a special lens appearing to capture light from the room itself. The Mario Tsai Studio was founded in Hangzhou China in 2014 with a focus on furniture and other products for the interior. 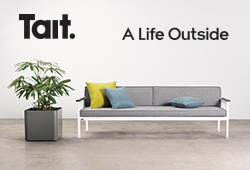 Tsai has co-operated with a number of manufactures from Italy, Denmark, Norway including Ferm Living, Valsecchi1918 and Northern. His stand at Satellite was a beautiful thing – soft and yet full of interesting designs that exploit the properties of their various materials. Design daily was particularly taken with the refined simplicity of the armchair.